Escalator Press have recently been celebrating the success of their author, L. J. Ritchie. His first novel, Like Nobody’s Watching, has been shortlisted for the Copyright Licensing NZ Award for Young Adult Fiction as well as the Best First Book Award in the 2017 New Zealand Book Awards for Children and Young Adults (NZCYA). The winner of each award walks away with $7,500. We caught up with L. J. Ritchie to see how he is taking the news. Currently hard at work on his second novel, Ritchie said it was ‘a big surprise’ to be told he was a finalist in the NZCYA, especially in such esteemed company as Maurice Gee in the Best Young Adult Fiction category. Ritchie hopes that the positive buzz around the prestigious awards will encourage readers to engage with his next Young Adult novel, an alternate-history thriller about eugenics in New Zealand during the Great Depression. Publisher Adrienne Jansen expressed her delight at the nomination, saying she is ‘very proud of Like Nobody’s Watching’ as a ‘great read that also asks big questions’. As Ritchie’s first book, she thinks it is ‘just the start’ of a successful career. 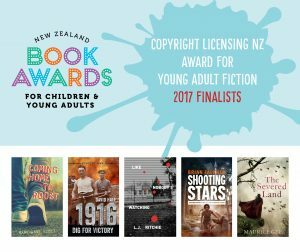 The 2017 NZCYA winners will be announced on 14 August. We wish Ritchie, and all other finalists, the greatest of luck. For more news please sign up for Escalator Press’ newsletter here.